What an outstanding experience! We fit in so much during our week at the lodge. The staff and other guests from FL quickly became new friends and we had some great times together. We returned home with halibut, salmon and crab to last us awhile and the fishing, hiking, kayaking, wildlife and great jokes will always be remembered as some of the many highlights of the week. Our expectations were exceeded. 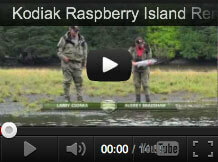 Now the countdown begins for our next visit to Raspberry Island. Thanks Birch, Tiffany, Mike, Chelsea, Scott, Devin, Sage, Fisher, Kenny and Linda. We had a lot of fun.